Regina Shober Gray’s diary changes tone after the onset of her husband’s fatal illness, in 1876, so what does the year 1875 sound like? Mrs. Gray is 56 years old when the year begins, and her children are almost all grown up. Her daughter Mary has already received, and rejected, at least one marriage proposal, while the boys are either in business or still studying at Harvard. Mrs. Patrick Grant has a Washington’s birthday reception on Monday, in emulation of her aunt Mrs. H. G. Otis – but no one in Boston is quite competent to fill Mrs. Otis’s place in that way, I suppose. Carrie Oxnard and Mrs. Richards, also, each have an evening reception on the 22d. Mrs. Richards’s is to be a “bal poudré” and she insists on all who come being in powder & patches & rouge &c., which will thin her numbers a good deal. Tuesday, 23 February 1875: We hear the bal poudré at Mrs. Richards’s was a failure in numbers, and especially scant of gentlemen. Boston people do not like such nonsense, and it takes a more leading person than Mrs. Cornelia Walter Richards to urge them up to it! Mrs. Grant’s [reception] from four to six was crowded but stiff – Carrie Oxnard’s small, quite pleasant & sociable. Philadelphia, Tuesday, 13 April 1875: Since I left home, three engagements have been confided to me, which are to be kept secret for longer or shorter times – one sorrowful piece of news also, wh[ich] must leak out ere long, but about which I am not to speak. News of Mrs. Ben Wainwright’s death met me here, too. Boston, Sunday, 10 December 1875: Last Thursday Mary [Perkins] dau. of C. C. Perkins was persuaded by young “Teddy” Wharton to cross the ice in Jamaica Pond, he having skated over it safely. It cracked – she slipped in her alarm, fell through and disappeared. Wharton went in after her and caught her by the lovely golden front hair, wh[ich] being part of the fair young head did not come off in his hand, as fraudulent back hair might have done! Morris Meredith, the other member of the party, in trying to help them went in himself involuntarily, and the situation which seems only ludicrous now was then rather tragic. [Their] shouts for help summoned a party of workmen, who made a line, got them half out, when some one’s grasp gave way, and down they went again – however they were all rescued at last, and conveyed to Pine Bank. Why they are not all laid up with rheumatism or pneumonia is one of the mysteries of youthful endurance & impunity! Hedwiga Regina Shober (1818–1885) was married to Dr. Francis Henry Gray 1844–80. All extracts from the Hedwiga Regina Shober Gray diary, R. Stanton Avery Special Collections. Josiah Bradlee (1777–1860) was the father of Mrs. Gray’s stepmother, Lucy Hall Bradlee (1806–1902), who was married to Samuel Lieberkuhn Shober 1830–47. Eliza Boardman Henderson (1796–1873) was married to Harrison Gray Otis 1817–27; her receptions, at her house on Mount Vernon Street, were nationally renowned. Caroline Walter Adams (1823?–1898), who married George Dearborn Oxnard in 1853, and her aunt Cornelia Wells Walter (1813–1898), at one time editor of the Boston Transcript; she married William Bordman Richards in 1847. On 6 May the diarist noted that she could finally speak of her daughter’s friend Lucy Bowditch’s engagement to Richard Stone. This report was incorrect. Julia Ann Sanderson Coolidge (b. 1814), who married Benjamin Greene Wainwright in 1834, died in 1882. Martha Catharine Codman (1858–1948). The elopement was probably an exaggerated report: Miss Codman did not marry until 1928, when she wed the singer Maxim Karolik; together they amassed a large collection of American decorative arts pieces, later donated to the Museum of Fine Arts in Boston. The painter John Amory Codman (1824–1886) married Martha Pickman Rogers in 1850. Mary Eleanor Perkins (b. 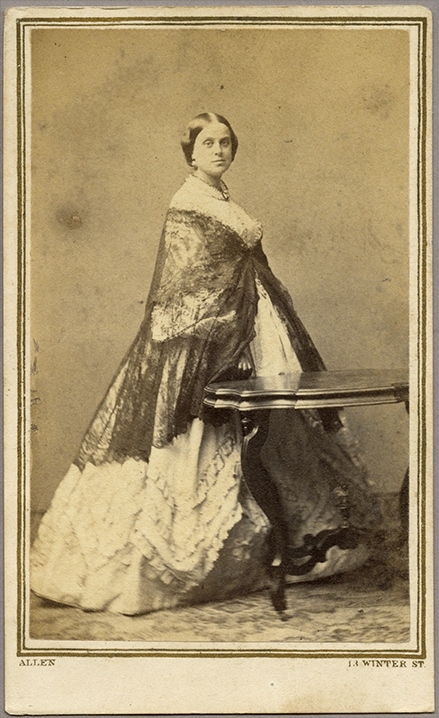 1856), daughter of Mr. and Mrs. Charles Callahan Perkins. Edward Robbins Wharton (1850–1928), who married Edith Newbold Jones – the novelist Edith Wharton – in 1885. James Morris Meredith (b. 1850), son of Mr. and Mrs. Samuel Ogden Meredith. The Brookline home of Mrs. Gray’s brother-in-law William Gray (1810–1892), who married Sarah Frances Loring in 1834. Re the Codman Elopement — Exaggerated? But then why did Martha not marry “for real” until she was 70 years old, and then to a “foreigner” to boot? Boston society people had long memories, and mothers like Mrs. Gray would have steered their eligible Harvard males away from, alas, “damaged goods.” Rescued and the marriage annulled (in England? ), then there would remain a “Still . . . .” There’s a Henry James / Edith Wharton “Washington Square” story there. Is Martha mentioned again in the diary? I especially enjoyed the part about the pair (or more) falling through the ice and the young lady being grabbed by the hair! We have a family story that my grandfather, who was a policeman, skated along the Charles River, rescuing people in similar circumstances.